Demand for Ford F-150, Edge, Escape and Explorer products is so great the company is idling certain plants for one week only in the summer shut-down in a bid to build 40,000 extra vehicles. In response to customer demand for Ford’s newest products, the company this year will produce close to 40,000 extra units by idling select plants for only one week during what has been the traditional two-week summer shutdown. As part of Ford’s annual production schedule, its North American manufacturing facilities will shut down from 29 June to 10 July for building maintenance and machine retooling. Based on strong customer demand for the company’s newest products – F-150, Edge, Escape and Explorer – six Ford assembly plants, along with supporting powertrain and stamping plants, will shut down only the week of June 29. Assembly plants include Chicago, Dearborn Truck, Kansas City, Kentucky Truck, Louisville and Oakville. The powertrain and stamping plants taking a reduced summer shutdown this year include: Livonia Transmission; Rawsonville Transmission; Sharonville Transmission; Sterling Axle; Buffalo Stamping; Chicago Stamping; Dearborn Consolidated; Kansas City Stamping; Kentucky Stamping; and Woodhaven Stamping. Demand for Ford’s trucks and utilities continues to be strong. 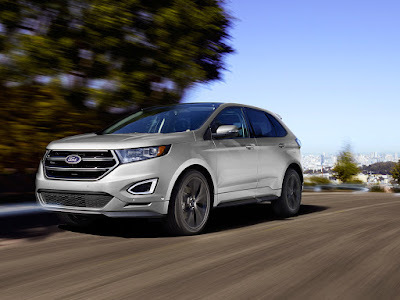 In April, Ford’s all-new 2015 F-150 with its unique 2.7-litre turbocharged EcoBoost gasoline engine was turning in just 20 days on dealer lots, while Edge - pictured below - which is also available with the 2.7-litre EcoBoost gasoline engine in the Edge Titanium, spent just 10 days on dealer lots. Escape inventories remain tight in a growing small utility vehicle segment. Explorer inventories are also tight, with the new 2016 Explorer just beginning to hit dealer lots as production ramps up. This is the third straight year Ford has kept plants running during summer shutdown in order to meet strong demand for its products. Over the past several years, the company has invested more than $6.2 billion and added more than 15,000 jobs in its U.S. facilities to help meet customer demand for its newest products. The increased production was included in the financial guidance Ford confirmed in its first-quarter earnings report on 28 April 28.